Rising up in the center of the small western Illinois city of Nauvoo is a temple -- not just any temple but a 150-foot tall rebuilding of the original Mormon Nauvoo Temple on its original site overlooking the Mississippi River. It's the largest building project this city of 1,100 -- and maybe all of Hancock County -- has ever seen, with some cost estimates ranging in excess of $30 million. It's not seen only as a construction bonanza by the residents, however. It's also seen as an infrastructure nightmare. To alleviate some of those fears, the LDS church agreed to pay $471,440 in cash, buy a new aerial fire truck and provide thousands more in services, including those of a city planner, before the city would issue a building permit last October. Still, some residents are afraid of the influx of people which they fear could change their small town into a real city with real city problems. The economic impact of the Temple will extend well beyond Nauvoo. When completed in May 2002, it is expected to be a Mecca for Mormons, who will make a pilgrimage to Nauvoo to trace their familial roots to the city and county they abandoned more than 150 years ago. As many as 500,000 to 1 million missionaries, pilgrims and tourists are expected annually with many staying as far away as Quincy, Burlington and Galesburg. Already, the city attracts nearly 250,000 tourists each year to see the original and restored structures of the original city. Besides visitors to the temple, Nauvoo will also attract genealogists of all faiths. The LDS church just opened the Joseph Smith Center in the former St. Mary's School and Convent across from the temple site. When competed, it will contain genealogical research facilities connected to the massive LDS church resources in Salt Lake City. Already, a smattering of computer terminals are available for such research. Legacy Constructors is the general contractor for the project. That firm is a coalition of three Salt Lake City contractors who often work together on large church projects such as this one. The architect, FFKR Architects and Planners, is also from Utah. Thomas says they have provided detailed plans for what he said would be an understatement to call a ''well-built'' building. The walls and floors are reinforced poured concrete and the exterior will be covered with Alabama limestone. The Thomas firm has already installed miles of piping and channels for piping in the concrete. According to LDS doctrine, the temple is a special place and that requires that only the finest materials and craftsmanship be used in its construction. There are 54 existing LDS temples worldwide and several others under construction. Carl Nelson of Burlington, Iowa is another local contractor working on the project but their job is almost done. They are building a concrete underground utility building that will hide most of the modern mechanical systems. It is connected by a tunnel to a sub-basement under the temple. When the project is done, the outside appearance will not give a hint of the modern systems installed within. It is being built on the exact spot, facing the same direction, as the original. While the temple is being built of contemporary materials and will have state-of-the art electrical and mechanical systems, the exterior will be identical in size and finish to the original 1840 structure. The outer perimeter measures 88 by 128 feet. The inside will be built to serve more contemporary needs of the church -- with six floors divided into a variety of spaces to be used for sacred ordinances -- ceremonies such as baptisms for the dead and eternal marriages. A huge baptismal font in the lower level will be built to match the original. While the original temple had two huge assembly rooms, the new one will have only one. Most of the ceremonies performed inside will not attract thousands of participants. Instead, there will be increased office space, meeting and special rooms. Those include a sealing room where brides and grooms are married for eternity and a celestial room for worship. Members entering the temple are required to dress all in white. Once open, only true believers will be allowed inside. An LDS church spokesman says that there will be a period, a few days to a few weeks, when the temple will be open to the public for tours and explanations but after that, it will be closed to all but members of the Church of Jesus Christ of Latter Day Saints. Even though the Reorganized LDS Church also has a visitor's center in Nauvoo and owns a substantial amount of the historical sites, a spokesman for them says they won't be allowed in the temple either. Members of both churches can trace their roots back to the original Nauvoo Temple. The split occurred after the 1844 assassination in Carthage of Joseph and Hyrum Smith with some Mormons following Brigham Young to Utah and others remaining loyal to the heirs of Joseph Smith. Nauvoo was settled by ten to 12,000 Latter Day Saints who fled western Missouri in 1838-39 after the governor ordered them exterminated or ''driven for the state.'' They purchased 660 acres of a platted but unbuilt town called Commerce. They renamed in Nauvoo, ''beautiful place,'' and started moving in. By 1846, an estimated 20,000 lived in relative autonomy with a unique charter from the state -- later revoked. 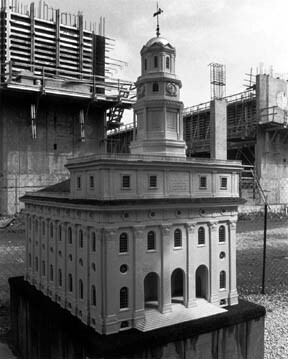 Construction on the original Nauvoo Temple started in 1841 from limestone quarried along the Mississippi River in Nauvoo. Construction took six years, and by the time the temple was dedicated, the exodus had begun. In 1848, it was partially destroyed by a fire of suspicious origin. The church then sold the structure for pennies on the dollar. In 1850, a tornado toppled two of the weakened walls and the only value it had at that time to the buyer was in the stones laying tumbled in heaps. In 1937, the LDS church purchased the site and maintained the archeological remains as a tourist site until April, 1999, when church president Gordon B. Hinckley announced the rebuilding. Hinckley attended the groundbreaking last October.